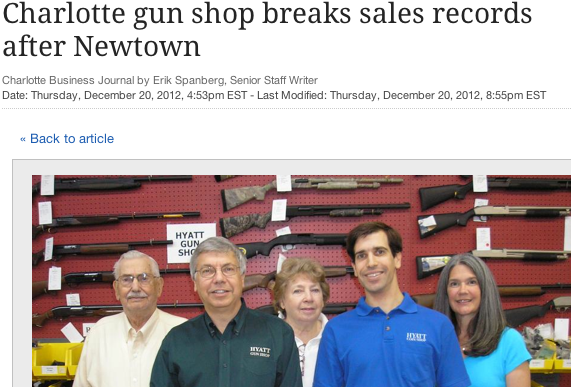 On Thursday, just six days after 26 people were brutally gunned down in a Connecticut elementary school, The Hyatt Gun Shop in Charlotte "racked up more than $1 million in sales," according to a Charlotte Business Journal story that cites Bloomberg news. It was the store's best single-day performance since opening in 1959 and an example of how some gun enthusiasts, fearful of increased regulation, have reacted to the shooting. Then today, National Rifle Association Executive Vice President Wayne LaPierre proposed his organization's resolution to a wave of gun violence that's plagued the U.S. this year. According to Gawker, LaPierre said every school should have an armed police officer by year-end. A protester carrying a sign with the message: "NRA killing our kids" interrupted LaPierre's press conference, and was eventually escorted from the room as cameras clicked away. Watch the video here.